This seems to be a replacement for the Single Zippered Breast Pocket Beige Jacket, which had been torn, bloodstained, stabbed, and burnt, before wardrobe figured out that maybe it couldn’t be recovered anymore. This coat has no breast pockets, only lower zippered front pockets. It both zippers and snaps, and seems to be a beige version of another one of Sam’s Dark Coat which was also introduced in S3. In Malleus Malificarum (3x09), Sam wears it whenever he is not wearing a suit. In Mystery Spot (3x11), Sam wears it when he confronts the Trickster at the end of the 6-months-that-weren’t. In Ghostfacers (3x13), Sam wears it at the end of the episode when he and Dean watch the video. In Long Distance Call (3x14), Sam is wearing it at the beginning of the episode when he and Dean are at the University, arguing about whether or not they should be taking on a hunt or focusing on saving Dean. In Metamorphosis (4x04), Sam wears it once they are on the road to Carthage, he takes it off briefly in the motel while they talk with Travis, but otherwise wears it for the rest of the episode. 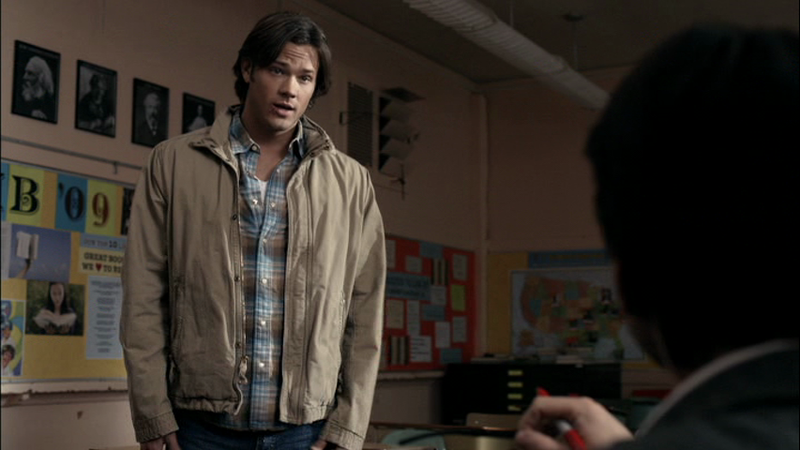 EXCEPT: In an unprecedented continuity error, Sam does NOT wear it when he is in Jack Montgomery’s hall closet. They accidentally put him in the wrong jacket for all shots filmed inside the closet. In I Know What You Did Last Summer (4x09), Sam wears it to go find Anna at the church. He takes it off after jumping through the rose window. In After School Special (4x13), Sam wears it when he goes to talk to Mr. Wyatt at the end of the episode. In Jump The Shark (4x19), Sam wears it at the beginning of the episode when they get the call from Adam. 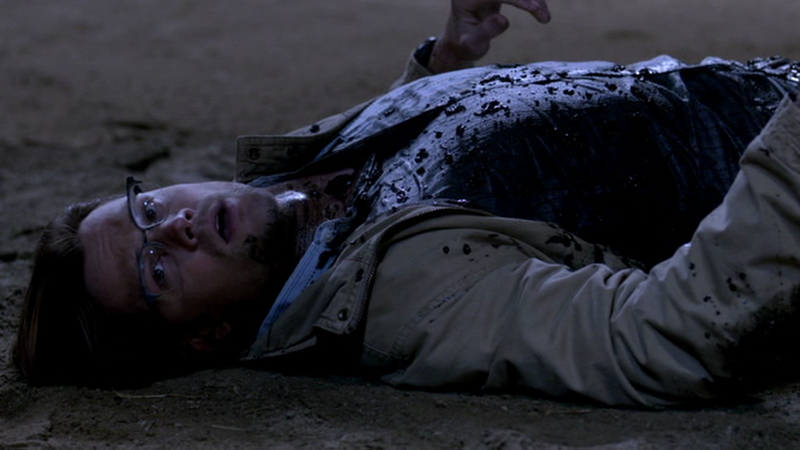 In Fallen Idols (5x05), Sam wears it at the end of the episode when he and Dean pack up the Impala and have a talk. In Changing Channels (5x08), Sam wears it when he and Dean bump into each other during the opening theme song. In The Real Ghostbusters (5x09), Sam wears it from the beginning of the episode until the ghosts are destroyed. In The French Mistake (6x15), Sam wears it for the entire episode. Only taking it off when he is in Meta!Jared’s office and wandering around the mansion at night. In Defending Your Life (7x04), Sam wears this coat while talking to Dean next to the Impala in the final scene of the episode. In Slash Fiction (7x06), Sam wears this coat at the end of the episode, when he leaves Dean. In Season 7, Time for a Wedding (7x08), Sam wears this coat when he and Becky arrive in Delaware and RSVP for the reunion. In The Born-Again Identity (7x17), Sam wears this coat at the end of the episode when he leaves the hospital. In Bitten (8x04), Sam is wearing this coat when he and Dean discover the bodies of the college students and watch the video that they left behind. We also see him wearing the coat when he and Dean are caught on camera killing the professor. In Southern Comfort (8x06), we see Sam wear this coat during his final flashback about Amelia, in which he shows up at her door to tell her that he does not pity her, because he too has recently lost someone. In Trial and Error (8x14), Sam wears this coat when he first sees Dean’s new room at the Bunker, but not in the next scene when Dean makes him a hamburger. He then wears it when they go see Kevin and keeps it on until he has to help serve dinner to the Cassity family, at which point he takes it off until he has to follow two of the Cassitys into the woods in order to prevent them from getting killed by a hellhound while they supposedly hunt down a wolf. He keeps the coat on until he kills the hell hound, and then is just in a t-shirt for the final scene of the episode. In Dog Dean Afternoon (9x05), Sam wears this coat at the very end of the episode, when he and Dean talk before they drive away. In Fan Fiction (10x05), Sam wears this coat from the performance of the play until the end of the episode. In Don’t Call Me Shurley (11x20), Sam wears this coat from after the Deputy kills her husband until the end of the episode. In All in the Family (11x21), we pick up where we left off, so Sam is still wearing this coat. He takes it off, once Chuck returns them to the bunker and they begin talking around the table. In Celebrating the Life of Asa Fox (12x06), Sam is wearing this coat when they show up at Jody’s at the beginning of the episode. He takes it off soon after their arrival and does not wear it again. FATE: When Sam jumps through the window in I Know What You Did Last Summer (4x09), he gets a deep cut on his left bicep. Presumably, whatever cut him would have had to have gone through the coat and shirts he was wearing too. Once, again, however, he seems to have repaired it. I have this jacket for fans to buy along with other clothing! Please contact me if you interested in buying Sam's American Eagle Beige Jacket. I have this jacket in various sizes, along with the Olive/Brown version of this American Eagle jacket in a size 2XL. Also, I have a lot of Sam's shirts in various sizes. I have Dean clothing too, so if your interested in buying Winchester clothing please email me at tylertroost@gmail.com. Look forward to hearing from you!